One is a based on a true story; the other is spin-off of a larger-than-life franchise. But Bleed for This – the story of boxer Vinnie Pazienza’s rise from a catastrophic injury to become a world champion – and Fantastic Beasts and Where to Find Them – a story about a magical character from the Harry Potter franchise – will go head-to-head at the box office this weekend. Both films are good – not great – but are as different on film as they are in the patrons they’re likely to attract. 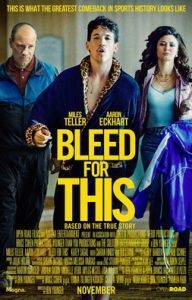 Bleed for This stars Miles Teller as Vinnie “Pazmanian Devil” Pazienza, a promising fighter whose partying outside the ring causes him to lose in the ring before a car accident almost costs him his life. He fractures his back and is in danger from never walking again. But like every feel-good sports movie, Pazienza makes a miraculous recovery and becomes a world champion. Teller is extremely believable in the ring, as his fluid movement and ability to rattle off punches like he’s banging a drum make him believable in the ring. His relationship with his trainer, a borderline alcoholic named Kevin Rooney played exquisitely by Aaron Ekhart, provides a human touch that’s integral to any sports movie. Pazienza’s comeback during the 1990s often gets overlooked among the greatest stories of athlete perseverance, but it’s impressive. The fact he exited the car crash alive is hard to fathom; the fact he became one of the best boxers on the planet is inexplicable. But Bleed For This won’t knock out Fantastic Beats and Where to Find Them. 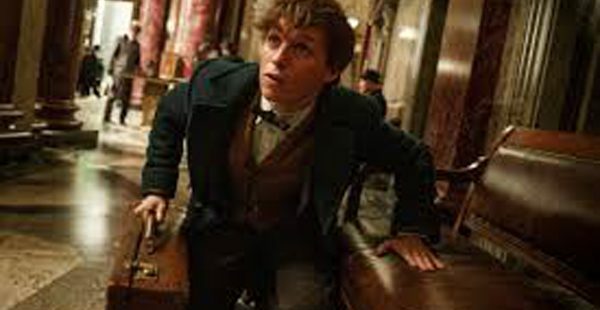 Beasts, which focuses on the journey of Newt Scamander and the creatures he brings to New York, follows in the footsteps of the Harry Potter franchise. The franchise’s eight films, which were released between 2001-2011, combined to generate more than $2.2 billion at the box office. Eddie Redmayne stars as Scamander and he’s every bit as good as Teller is in Bleed for This. But Redmayne’s movie will likely be the winner at the box office since Scamander has Harry Potter in his corner, even if the Hogwarts School of Witchcraft and Wizardry’s most famous student doesn’t appear in the movie. For those of you who haven’t heard of Scamander, he wrote one of the books that Potter studied while taking Hagrid’s class in J.K. Rowlings’ series that became a worldwide phenomenon.